MIX CREATIVE WINS TWO 2013 AMERICAN GRAPHIC DESIGN AWARDS! We’re SUPER excited to announce that Mix Creative has been selected to receive two 2013 American Graphic Design Awards from Graphic Design USA. This is Mix Creative’s third consecutive year to receive this award. The winning entries, honoring outstanding work of all kinds and across all media, were selected from more than 8,000 entries submitted from across the country. Award applicants were from advertising agencies, graphic design firms, corporations, associations, universities, government, publishers and more. Only 15% of entries receive a Certificate of Excellence. We gratefully share these honors with our client, Kiva Sherr-Nelson of Mama Luna Natural Apothecary. Kiva came to me with a beautiful vision for a store that provided a safe and welcoming atmosphere for mother and families to select and purchase botanicals, nutritional supplements, organic and natural children’s products and handcrafted gifts. This lovely store is now just over a year old and a favorite among local mothers. 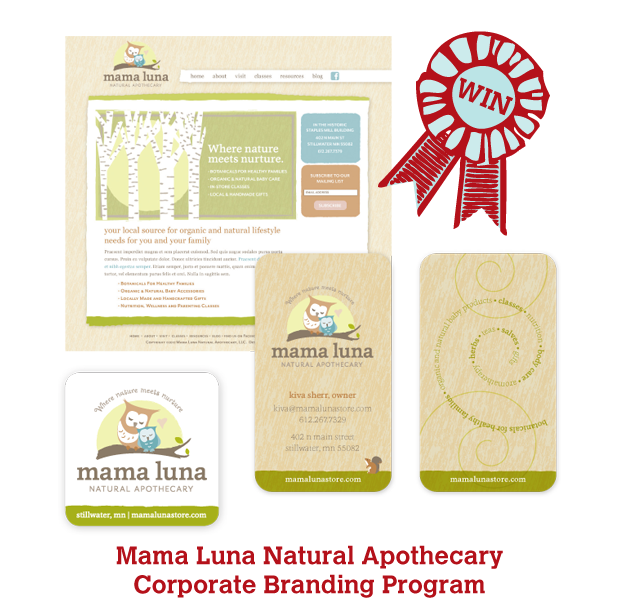 Special thanks also to Steven Ray, Mix Creative’s web developer, for his great work in bringing the Mama Luna Natural Apothecary website to life! Q. How have you seen your business grow since you opened Darn Knit Anyway in 2009? A. It’s grown a LOT! We’ve gone from 2 to 6 staff members and our sales are up 30% from our first year. We’ve also launched online class registration, started Darn. Knit. University, introduced our 12 in 12 program (12 sweaters in 12 months), and are about to add online yarn sales. Q. How important is branding to your business? A. In my mind, my brand includes my voice, my customers, the way my shop looks and feels, our staff, our website, our logo…everything. It’s important that everything associated with the store has the same welcoming, modern, easy feel. Our brand is totally about knowing who we are and conveying that in everything we do. That way, people always know they’re in the right place. A. We primarily market with our e-newsletter, Facebook, Twitter and word of mouth. Q. Which marketing tool do you feel is MOST important to your business? A. Our e-newsletter is very important. We always see a spike in web traffic the day after I send it. Facebook is also important. We currently have 2097 likes. A recent photo we posted was shared 1200 times and had a reach of 130,000 views! Our average share is 3–6 and our average view per post is 500–1000. Q. What lesson have you learned about marketing that you’d share with new business owners? A. Go in STRONG. You have to be solid on your brand—know what it is—when you open. You can’t trickle in with your brand. Know it and launch it ALL OUT with a cohesive look and feel. It’s critical that all your stuff looks intentional. Have someone help you. In addition to the marketing tools Aimee mentioned in our interview, Aimee has also published 277 blog posts on her website; created an implemented a program called “Darn Knit Anywhere“, which encourages customers to photograph themselves with their Darn Knit Anyway tote bag and email it or post it to Facebook for a discount; and helped organize events such as the Stitch-and-Pitch at the St. Paul Saints game or her own Naughty Knit Night, which was featured on Fox 9 news. Thank you to all who attended the Small Business Leadership Conference today at Rasmussen College School of Business. I was honored to be able to present our talk on honing your brand message. In case you missed it, or just want to revisit some of the elements that make a brand, here’s a link to download a pdf of our Powerpoint Presentation. Best wishes, and please keep in touch! Note: this article is reprinted from our monthly e-digest, >the mixer. Click here to be added to our email list. For companies that are serious about defining their brand and audiences, a creative brief is the essential first step. Here at Mix, our work with a new client starts with an in-depth question and answer session with our clients that gets to the heart of their business. From there, we prepare a written creative brief that guides the work we do together. What’s in the guide? For starters: the company’s objectives, audiences, competitors, personality, unique selling points and much more. The brief paints a picture of the company from past to present and into the future, and informs all of the visual choices we make about the brand throughout the design process. Determining a company’s color palette is about more than aesthetics—it’s setting the groundwork for creating readily recognizable designs to represent your business. A brand’s color palette takes into account the logo colors, primary and secondary text colors, colors for links and rollover states, accent colors, seasonal or specific product variations and more. The color palette is crafted to set your brand apart from competitors and express your brand’s personality. Implemented correctly, a brand’s color palette should be as recognizable by audiences as their logo. To prove my point, answer the following: what colors to Target employees wear? What are the colors of the Walmart logo? Simply put, fonts influence meaning. Imagine you see a billboard for two similar retail shops. Billboard 1 features a sleek, edgy font you’ve never seen before. Billboard 2 features Arial, a font available on any PC. Which retail shop do you assume has a larger marketing budget? Which do you imagine is more successful? It’s incredibly important for a brand to select an appropriate font or set of fonts to use as part of their brand identity and stick to it. Consumers will come to associate the font with your brand, serving as a sort of mental shortcut in conveying your brand message. See our blog post for more on selecting fonts (including a fun mind-bending activity!). Does this mean Erbert and Gerbert’s should have a legal smack down with Zantigo? Nah…I’m sure it wasn’t intentional. Nevertheless, it has the potential to cause some brand confusion among consumers who frequent both restaurants. So what can designers learn from this? Well, while big, multinational companies can afford to have font designers create a custom font for their brand, smaller businesses will likely need to draw from the existing type pool. And huge as that pool might be (MyFonts.com has over 90,000 fonts from more than 900 foundries), chances are that some designer out there is going to select the same font as you. If you’re lucky, it’ll be in a totally different industry and application, and the two fonts will never meet the same consumers’ eyes. However, as the example shows above, this isn’t always the case. One option is to alter the font you select for the logo design in some meaningful way: create a custom swash, elongate or compress letters, embellish the letters, or even mix fonts. The more creativity you bring to the design, the less likely the font will be the most distinguishable aspect of the logo. 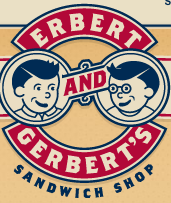 For example, while I adore the treatment of the word “AND” in the Erbert and Gerbert logo, the designer may have been wise to alter this highly recognizable character (which I’m sure is a glyph available within the font) to make it unique to the brand. Another option is to avoid common fonts altogether when creating a logo design. This includes any of the fonts that come with Microsoft Office, Windows, Mac, and Adobe Creative Suite (except, of course, if you plan to alter the characters). You may also do well to avoid relying heavily on free fonts from sources like Dafont.com (which typically has restrictions on commercial use of their fonts anyway), opting for fonts purchased from type foundries instead. This can get expensive, but typically when I’m mocking up concepts, I’ll either use a sample of the type or buy a single face for the comps, then buy the full font when a client selects a logo. Purchasing off-the-beaten-path fonts may help you in your quest to avoid the “oh my gawd she’s wearing the same dress!” syndrome, but it’s still no guarantee. A third option may be to restrict the use of highly recognizable display fonts to a logo—perhaps even penning your own logo type—then relying on more generic, less recognizable font for the bulk of the brand communications. With this tactic, other brand elements and colors do the work of communicating the brand to consumers. Before I close, I should probably fess up to two things. First, this has totally happened to me! A recent Target holiday circular used one my clients’ logo fonts in their ad. Luckily, Target is likely to drop the font after the holiday promotion. Second, as a designer, I’m far more likely to notice these type twins. Will the consumer even notice? Chances are if they do, they won’t be able to communicate more than that a design “feels familiar” (unless it’s my 11-year-old, who seems to have a photographic memory for all things advertising!). Noticed any type smack downs of your own lately? I’d love to hear about them! Leave a comment below, or post examples on our Facebook page: facebook.com/mixcreative. Podcast and social networking site that offers a very easy way to create on-demand audio. Offers an easy way to publish your own audio and video podcast in 3 steps. There is not technology curve. You can share your podcast in Facebook, Myspace, Blogger, and other online destinations. Standard on Macs, features built-in tools that you can use to create your own rich and professional-sounding podcasts. Webpage which allows you to create code to embed a podcast on your own website. This is a point and click operation which requires no technical knowledge. Janice Hurley Trailor: Nice mix of media and content, good case studies. Bourn Creative: Excellent depth of content, engages readers to interact. Martha Stewart: An expert at self promotion. Pretty extensive! Over the past few months WIN has provided sessions on the mindset behind thinking big and being seen as an expert. Now that we have the necessary way of thinking, its time to pull out tools to brand ourselves as experts. In this session, Katrina Hase, branding veteran and owner of Mix Creative, will reveal top tools and techniques you can implement this year to establish yourself (and your business) as an expert in your field. These same techniques have helped her clients’ businesses to develop a following of loyal clientele who recognize them as experts. Katrina was the recipient of WIN’s first Destined to WIN award recognizing her for the intentional growth she has realized in her business which serves as an inspiration to all women in business. Discover how to craft a content-rich website, create an editorial calendar for your business, and utilize multiple channels — including speaking, self-publishing on the web, PR, and social media—to deliver your brand message. A list of resources will be provided to participants. Previously, Katrina served as art director at a Saint Paul ad agency, where she designed and managed client campaigns and guided the company’s own rebranding. As a freelance art director, Katrina designed marketing collateral, websites and ad campaigns for local agencies including Acuitee Marketing, All Out Marketing, Echo Creative, Falls Agency, and M Design Interactive. Prior to freelance work, Katrina worked for eight years as an exhibit developer and project leader for new exhibits at the Science Museum of Minnesota. Katrina has a BA in Psychology and an AAS in Graphic Design and Visual Communication. Katrina frequently lectures and writes on topics of marketing and design. She has participated as a panelist at WIN SparkHer and Destined to Win events, was featured as a guest speaker for a TechNetworking webinar and classroom series, and was a guest lecturer for the Graphic Design & Visual Communication program at Minneapolis Community and Technical College. Her written work can be read on a local and national level. For companies that are serious about defining their brand and audiences, the creative brief is the essential first step. At Mix Creative, we typically start our work with a new client with a discovery session—an in depth question and answer session with our clients that gets at the heart of their business. From there, we prepare a written creative brief that will serve as our guide throughout the work we do together. 1) The brand story. In order to understand where a company is headed, it’s important to understand where it’s come from: who were the founders, why was the business started (what was the impetus behind starting the business? ), when was it started (and what was the cultural climate like then? ), how was it started (as a sole proprietorship? An LLC? A Corporation? ), and where it was started. 2) The brand objectives. What measures the company’s success now, and 10 years from now? 3) The brand promise. Simply put, the need the company fills for its clients. 4) The products and/or services. What are the products or deliverables clients look to the company to receive? 5) Brand benefits. What are the benefits to clients in using the company’s products and/or services. And…what is the benefit to consumers in purchasing this brand versus others? 6) Target audiences. Arguably the most important part of the brief, this section dives into who the company is selling to, including the psychology of their buying habits, their influences, their demographics, and much more. Understanding a business’s target audience is critical to that company’s success! 7) Competitors. It’s important to know and understand a company’s competitors in order to communicate to audiences how your company is different. It’s not uncommon that a client will come to me saying that they have NO competitors. To that I say, WRONG! Even if there is no one out there doing exactly what you do, there are plenty of companies out there competing for your audiences’ dollars. 8) Inspirations. Much as it is important to understand those seeking the same dollars as your audiences, there is much to learn from companies in unrelated fields that are reaching out effectively to their audiences. 9) Brand personality. This section focuses on the feel or tone of the company. Questions in this section weigh heavily in establishing the overall brand’s look and voice. 10) Brand elements. Companies may already have completed much in the way of the look and feel of their brand; sometimes the challenge is bringing disparate elements of the same brand together to form a cohesive whole. What emerges from the brief is a picture of a company from past to present and into the future. Most of our clients find the discovery process to be enlightening, awakening their minds to aspects of their business they hadn’t considered since they began the business. Thank you to everyone who attended the Market Like You Mean It breakout session at the Destined to Win in 2010 conference. We had so much fun presenting and loved the energy in the room! Brand Description: a statement about your company that summarizes what you’re there to accomplish. Can include your brand’s mission and vision statements. Brand Services: A clear statement about what your company offers, including the features and benefits. To illustrate the above, consider a gorgeous, sophisticated brand for a company marketing to preschoolers. Message lost! Who’s buying? Why? How? Where? How often? Influences: What are their peers buying? What’s mom say? Business associates? Media: What are they watching on television? What radio or podcast stations do they listen to? What billboards do they see on the way to work? What newspapers do they read (do they get a paper newspaper or read online?). Even if you never advertise in these mediums, your competitors may. It’s good to know what they’re seeing to be able to differentiate your own business. Are they someone you want to work with? Do they match your aesthetic/philosophy/company mission? Will they withstand fluctuations in the economy? Consider having 3-5 industry focuses. Ask your clients. Sounds simple, but when is the last time you did it? Study shopping patterns. Review your invoices/register data: what’s your most popular suite of products/services? What needs to be dropped or marketed better? Ask sales staff. They’re likely to have a lot of good anecdotal information about your clients/customers. Solicit blog comments. Offer a discount or special to people who leave feedback. Check online reviews. There are a number of online sites dedicated to providing product and service reviews. Make sure you know and check the sites where your customers may leave feedback. Polls. You can post a poll to your blog or send out an email poll via a service like Constant Contact. Ask in your email footer. With every message you send out, pose a question to your clients in your email footer. Any response is a valuable response! Offer something of value for their email address. They’re giving up their private data, so make it something worth while: an insider’s guide, a book, a gift certificate, a free webinar, or one of your products. Make sure your email sign-up link is everywhere: every page of your website, on your blog, your Linkedin site, Facebook page, email footer, etc. Comment on other’s social media pages. Especially people who are complementary services to your company. Your comments will include a link back to your website/blog and will build followers online. Host a webinar or seminar. They’re a great opportunity to see who’s interested in your services, and to request emails. Business card drops. Follow up with people who drop a business card and ask if you can add them to your email list. In store sign-ups. One client of mine asks each customer at the time of check-out if she can add them to their email list. Email footer. This is unused space, folks! Take advantage of this spot that already has your clients’ undivided attention to provide a link to sign up for your e-newsletter. Educate audiences about your product. Network, host events, give demonstrations, and even offer classes related to your products and services. See more ideas in my previous post, Tips for Surviving the Economy. Gone are the days when everyone watched the same programs (and commercials) on television. Today’s audiences are incredibly segmented, getting their information and influences from incredibly diverse sources. Trying to reach, well, everyone, therefore, is a nearly impossible task that requires a herculean budget. It’s smarter, more efficient, and lucrative to go after a small chunk of the market. The trick is to go at it full-on, don’t be timid! Communicate your niche to everyone you know! When you understand your target audiences and present your brand consistently and thoughtfully, you’re on your way to Marketing Like You Mean it! Thank you to my co-presenters Renee Godbout (May Advertising and Design, Inc) who presented Creating and Stretching Your Budget, and Stephanie Hansen from Printz.com and FM 107 for presenting Marketing Tactics.